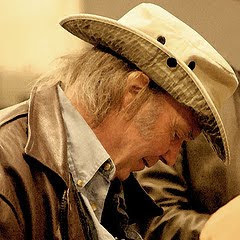 In a SXSW session moderated by Harp Magazine senior editor Jaan Uhelszki, Neil Young discussed the creative songwriting process, channeling the muse, and possible next moves. "After recalling how Young's "Ohio" helped changed public attitudes towards the Vietnam War in 1970, South By Southwest co-founder Roland Swenson looked backstage and said "Mr. Young, if you can hear me back there, we need another song," a reference to the current U.S. military action in Iraq. In response, Young told the audience, "I write totally out of the air. I really am, more than anything, a reflection of what I see. (Swenson) was trying to give me some input a few minutes ago. I hope it takes hold." "In response to Uhelzski's comment about the spontaneity of another well-known musician of similar vintage, Lou Reed, Young sang the hook of Reed's "Walk on the Wild Side," provoking whoops from the crowd. He also acknowledged the evolutionary career path of another rock 'n' roll peer: "I've read Bob Dylan saying things I can really relate to. He just says, 'No, I don't know who that was (who wrote the songs).' He's not who he was." "When you're terrified, you really know that you're right," he said. "It's good to be scared, to be on edge." He took a shot at a USA Today reviewer who maintained that Young was ripping off his audience by not performing the songs they wanted to hear: "I said to myself, I'm really onto something here." "'The one constant is not to let yourself get distracted' when a song is trying to find you, he said. Once you have an idea with music, Young continued, nothing else matters but that idea. 'Your responsibility to the muse is to follow it.... There's nothing more important ... Commitments are one of the worst things for music making _ they're annoying.'" "I'm proudest of my work when it comes really fast [and] I don't edit it. It's the purest form of creativity ... you just have to be there." And, he pointed out, you can't worry about the result while you're in the midst of creating. Afterwards, he said, you can "scrap it, record it or dump it in the editing bin," but, he added, "When you're terrified, you know you're on the right track." "Now, there are big breaks and [then] it's just like a dam bursting," he noted. "I used to write a song every day." "'People want to know why you don't make your most famous record over and over again,' he said. 'Because it's death.'" "it always bugs me to think that people like neil young never really came down off their rock star mountaintop to teach and share what they do. that's some selfishness right there. that's entitlement. but it goes even further, because not only didn't they teach, but in some vague way they still to this day imply that what they do can't be taught. they characterize themselves as the chosen vessels of the muse, as if they never worked or tried to figure out how to do it. I guarantee you that when neil young was in his teens and twenties, that all he did was try to figure out how it's done. but in the keynote, young trotted out his worn-out old notion that says you have to treat creativity like a wild animal, approach it cautiously, make little noises to get it to come out of its hole, and then carefully try to engage with it for a while before it runs away. ok, first of all, there is something profound about this notion, don't misunderstand me. it's quite true, and it's inspiring. but coming from someone like neil young, there's an antique, sixties, almost cheesy whiff of anti-intellectualism about it that I find both kind of funny and also really really irrelevant. maybe it's some kind of dusty, kerouac-lite romanticism?" And what's next for Neil? Thankfully, he's not ready to go to pasture. "I just turned down a promoter. We were going to go out on the road and they wanted to say it was Neil Young's Greatest Hits. That was it. They were done. I'm waking up with this massive, distorted hideous noise [in my head] and it makes me feel like I'm going home." Maybe it's time to head for the ditch? Also, see video of Jaan Uhelszki's interview with Neil Young and Johnathan Demme at South By Southwest Festival. More on Neil Young following his muse. Well, I went to Pandora to comment on what was quoted here. It's innaresting how people develop expectations about NY, and how they can be so upset when he doesn't do what they think he should do. Seems to be a recurring theme. off topic,I know, but NY sez first release from the Archives out "in a couple of months" !?!? As someone that works in a 'creative field' in a business world, I spend my days hunting for creative solutions--because of deadline. But as Neil says, the best ideas are from the muse, come out of the blue, when your mind is elsewhere. Can't count the number of times a creative solution comes when in the shower or driving a car. Neil knows. There are no simple answers.